Checking over the fleet of new-for-2013 snowmobiles leaves us with as many questions as answers. We believed that Arctic Cat would continue to develop its new ProCross models and make them better as engineers solved some typical early Year One issues. Frankly we expected more from Ski-Doo, but the company’s MXZ models hold a healthy lead in the big bump trail market. Polaris continues to be popular with both trail and off-trail ridership. That leaves Yamaha, whose only really new product for 2013 was its kiddie sled, the SRX 120 and a nicely updated Nytro XTX off-trail sport model. 2013 offers no big, big news from anyone in the trail, two-up for utility markets, as the manufacturers expanded on successes more than bringing us all-new models. Although we’re certain that the sled makers would disagree with our cavalier findings. Still, we found sleds to like, some we liked quite a bit more than others, but in many cases we find the 2013 crop of models almost too close to pick a class leader. Bring on the hanging chads as we cast our votes for Best Sleds of 2013. The Thief River Falls, Minn. pioneering sled maker is once again primarily a snowmobile company as sled sales again bring in more revenues than its ATV and side-by-side lines. Arctic Cat invested heavily in the new model. Supposedly it is the final complete line overseen by chief Arctic Cat snowmobile guru Roger Skime. When the new sled was introduced to the media last year, Skime noted that this would be his last sled project. Well, don’t always believe everything you hear, even if it was from Roger Skime himself. He won’t simply ride away from Arctic Cat after influencing six decades of Cat sleds. This has never been a job for him. It’s a labor of love and we hear that he still issues important opinions about Arctic Cat snowmobile products, even though he claimed he would be retiring. Right! With 121 ft-lbs of torque and 177 horsepower, the turbocharged Cat has the power to move you — quickly! The ProCross models bear tricks and knowledge gained from racing, hard mile testing and an uncanny passion that Roger Skime imprinted on just about every employee at Arctic Cat, especially those in the research, development and engineering areas. Check out the fact that the new XF and F series ProCrossers deliver exceptional on- and off-trail handling. That Arctic Race Suspension works. It may look a bit ungainly, but it grips. That rear suspension made the transition from the previous chassis to the ProCross design simply because it works. While Polaris reinvented the trail suspension with its Rush and Ski-Doo came out with rMotion, Arctic Cat stayed consistent because its rear suspension already did what the other guys were trying to do. If Arctic Cat has a problem, it comes under the hood. For now Suzuki makes its engines. For the future? 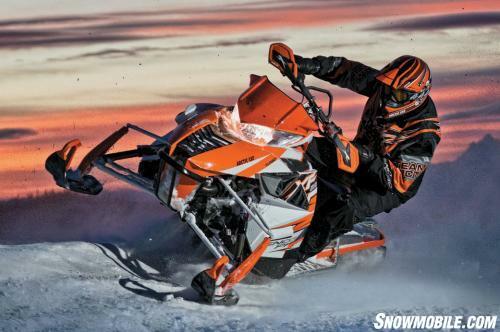 According to sources, Arctic Cat is prepping its St. Cloud, Minn. engine assembly plant to accommodate a production line for sled motors alongside the two it has for ATV engine production. The ATV engines being built are four-strokes. As any snowmobiler knows, Arctic Cat can certainly make four-strokes fly, witness the power and trail smarts of the Arctic Cat F1100 Turbo. Popular and well designed, Arctic Cat snowmobiles for 2013 are similar to last year’s models…only better. The Rush is one of the anchors of Polaris’ trail lineup. Wow! The other northern Minnesota snowmobile maker engineered a mountain sled that weighs less than the lightest trail sleds. Although Polaris trail and off-trail units share in that engineering DNA, they are comparable to the competition as to weight, engine and essential performance. The Polaris Rush with the outside-the-slide-rail shock setup provides a good ride, but that market is quickly giving way to the stretch track models that can handle both on- and off-trail riding. The development of the Switchback with the longer track and, we feel, more comfy and tunable Pro Ride suspension is quickly becoming the niche sled to have. Polaris Cleanfire semi-direct engines run crisply and bring handsome power to the track. 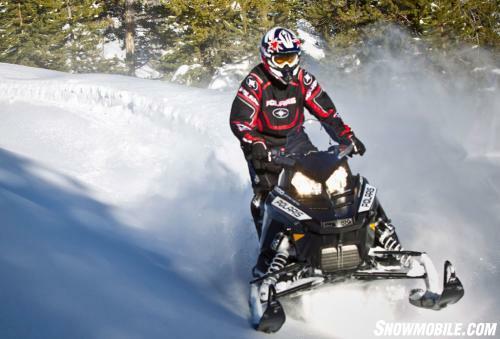 It may be that sled designers looked to Ski-Doo’s REV series for some ergonomic thoughts, but why not? Ski-Doo has been the market leader. Polaris is closing the gap as it works to regain the Number One status it held back in the halcyon days of the Indy, which reappears for 2013. 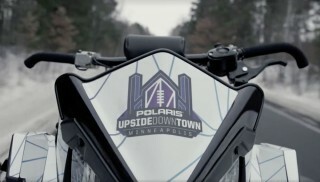 Polaris derives sales from a strong mountain segment and also competes well against both Arctic Cat and Ski-Doo in the trail arena. The two Pro Ride sleds (Rush and Switchback) score well with consumers and give Ski-Doo a good challenge. Rotax direct injection E-Tec gives you the weight of a two-stroke with the advantages of a four-stroke for fuel and oil consumption. 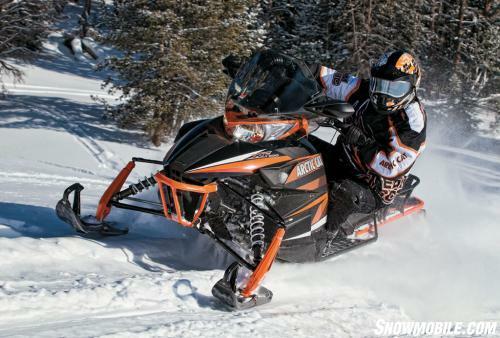 The Valcourt, Quebec snowmobile pioneer refuses to give up any market share without a fight. Look at the mountain segment where the tMotion suspension design totally reinvigorates the Summit powder models as real challengers to the best-selling Polaris RMK. In the trail segment, Ski-Doo does well, but holds an edge with its MXZ series in the action trail segment. 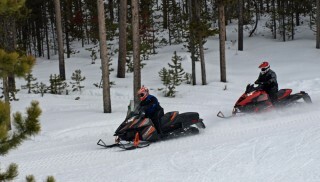 The addition of more rMotion availability in this category gives Ski-Doo serious ammunition to counter the Polaris Rush, but where we expect Ski-Doo to gain literal traction is in the stretch track category as its rMotion Renegades virtually match the Polaris Switchbacks feature for feature. Like Polaris, Ski-Doo relies on its own in-house engine source. Depending on whom you ask, the Rotax engine is the best when it comes to power, fuel economy and consistent performance. The direct injection E-Tec twins give the Ski-Doo models a two-stroke weight advantage with near four-stroke emissions and fuel economy attributes. At first glance the 2013 Ski-Doo trail and off-trail entries seem marginally changed. 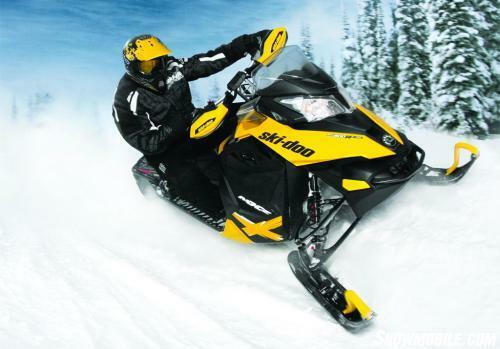 In a move reminiscent of Yamaha’s Apex update a season back, the Ski-Doo updates seem minimal, but the new “look” of the body panels give more rider protection and redefine the sled for improved off-trail movement through fresh powder. 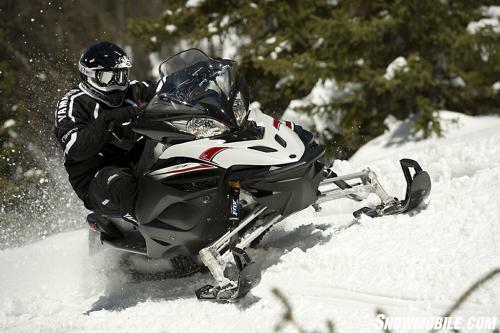 The MX series with REV rider forward design radically changed snowmobile design for the better. That remains the strength of all REV-chassis Ski-Doo models. And we think it doubtful that any other sled maker understands serious long distance riding as well as these Quebec-sourced models, especially the luxury sport models. Indeed, Polaris and Arctic Cat offer “adventure” models with bags and tall windscreens, but Ski-Doo has been on top of the two-up and solo touring world for decades. It helps to be adjacent to one of the world’s best snowmobile trail networks. 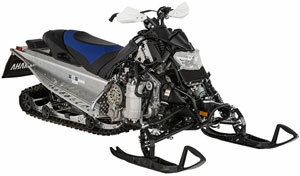 Yamaha is offering a supercharger kit for its FX Nytro sleds for 2013. 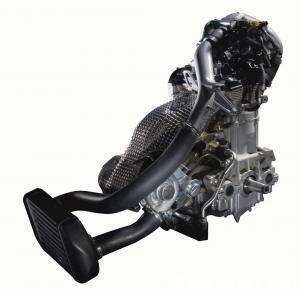 You might have suspected that Yamaha would bring out a trail boost for its Nytro three-cylinder four-stroker. After all, when power to weight is an issue, add power. A Mountain Performance turbo does that for the Nytro MTX. You can add an MPI supercharger to boost power on a 2013 Nytro, making it slightly more powerful than Arctic Cat’s full production Turbo versions. To give its Nytro model a broader appeal, Yamaha claims its market research shows off-trail riders want more capability in a single sled to ride the pre-groomed trails and ungroomed fire and forest roads common to the Midwest. 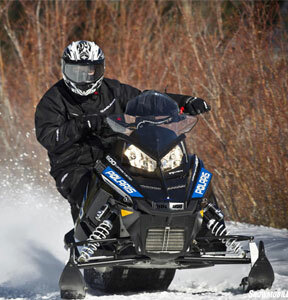 Enter the 2013 Yamaha Nytro XTX 1.75, a stretch track with deeper snow gripping lug profile and broad-based torque of Yamaha’s one liter four-stroke. But, who would have thought that this trail engine could handle another 50 horsepower with no serious upgrades other than the addition of the supercharger? That has to be a tribute to the Yamaha motor, but, again, why should you be surprised as that is what Yamaha does. Build engines. We forget that the Apex quad motor comes with successful world championship racing DNA in its fuel line. The Phazer twin derives a heritage from high-revving dirt bikes. And all Yamaha engines enjoy a heritage built into them from engineers with experience in Formula One racing, direct injected outboard motors, and even history with high performance Ford and Toyota automobiles. That Nytro XTX 1.75 gained attention second to the kid-sized SRX 120, a collaboration with Arctic Cat, which supplied the chassis to house the Yamaha single cylinder engine. The re-entry to the kid market resulted in a sell-out of the blue SRX 120 models. Last season Yamaha continued with its redesigned Apex and added those changes to the Vector and some Venture models. Key engineering at Yamaha may be a bit subtle to the everyday rider, who can only appreciate the effects of Electric Power Steering from behind the handlebar or the natural power boost from exhaust tuning on the EXUP-equipped Apex models. Unless you feel the difference between the older Yamaha and the newest ones, you may think nothing has changed. The Apex response is amazing as it gets both EXUP and EPS. We can’t find any other sled to knock the “king” Cat off our best list. It is the fastest, most powerful sled on the snow. It screams in a straight line but with the refined Arctic Race Suspension and its racer-inspired ergonomics this sled relishes tight corners that you can charge into and power out of. Its rear suspension enjoys another year of tweaking and provides a ride equal to any other in the high performance trail sled segment. While we opted for the short track version as our choice as Best of the Best last year, we find the 141-inch track on the 2013 “crossover” adds a dimension of versatility to the XF1100 Turbo as it allows groomed trail riders to enjoy added ride comfort due to the longer wheelbase, but makes this sled fully capable off trail. With its 177 horsepower and 121 ft-lbs of torque, you’ll appreciate the longer paw print the Cat puts on the snow – on or off trail. Fitted with the ProCross chassis, the 2013 Arctic Cat XF1100 Turbo has the power and lets you have all the glory you’ll want. Yamaha tuned this four-cylinder, four-stroke to deliver the goods via a sophisticated fuel intake and exhaust system that gives you smooth low end drive away and turbine-like acceleration. 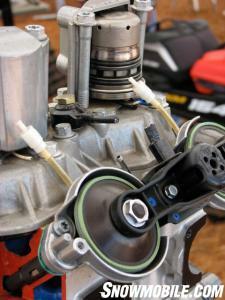 And don’t forget the power steering that eases your body on slow, tight trails. This best sled runner-up is an underappreciated powerhouse. Polaris calls itself the “terrain dominator.” We call it best for on or off trail in a performance mode. 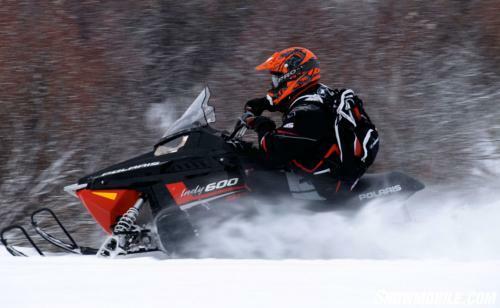 That Cleanfire 800 works well in the Pro-Ride progressive action set up that is the basis for this crossover snowmobile. Equipped with the Walker Evans “goodies” the Pro R version adds extreme tunability to a very capable snowmobile. The racing-inspired upgrades make this sled a very good handling one and its extra length track adds off-trail confidence to the rider. The Switchback and its longer Rush-based rear suspension provide a great ride. The best ever Nytro enjoys an engine with a masterfully tuned powerband that works great off trail. The longer track and its aggressive 1.75-inch lug profile fills the bill for serious off trail riders. If you are serious about raising your power to weight, you can always add the optional MPI supercharger. But, hang on if you do! Although in limited availability, this is the “nasty” Ski-Doo for the trails. Short of the racer replica, the “X” brings the new XS body style. It blends in the 163-hp 800cc direct-injection E-Tec and combines that with top of the line rMotion rear suspension that includes a premium shock package. This is the sled that serious big bump bruisers want. No pretense here, this sled is meant to be ridden hard and put away icy. There’s no pretense in this Cat, either. It has the Suzuki-sourced 800cc two-stroke twin and cross-country replica components. It may be a bit harsh for some riders, but it will suit the big bangers with Cat green in their blood. Yep, we’re gluttons for memories and the Indy name brings back lots of very fun ones. Equipped with the Pro-Ride front suspension, Pro-Steer skis, the base Pro-Ride chassis, new curved handlebar and the same Cleanfire 600cc two-stroke twin that powers the Rush and Switchback, we ask, what’s not to like? You can get the base 600 Indy, but we much prefer the “SP” version. Polaris brings in a winner with this sled. It will light up sea level trails, corner extremely well and give you a jolt back to remembering what snowmobiling is all about. Like the Indy, this sled is fun to ride, light and nimble but with less power, but four-stroke efficiency. Taking a page from Polaris, Arctic Cat counters the competitions’ models with a unique Arctic Cat effort that brings together the new XF stretch chassis with a four-stroke 1056cc twin. This sled offers off-trail capability with the longer crossover chassis. You can opt for a turbo version of this motor or the popular 800c two-stroke, but for sport touring the base “600” class engine works just fine. 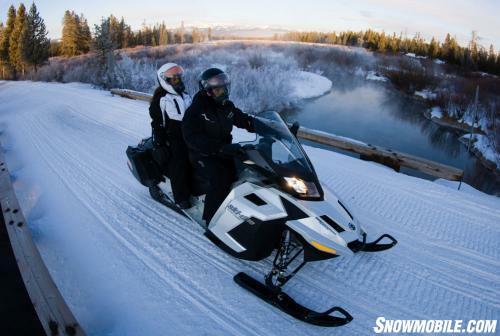 We see this sled as offering more sport riding capability than Ski-Doo’s GSX model and more off-trail opportunities than the Polaris 600 Adventure, which we chose last year. The 2013 XF1100 CrossTour offers plentiful luxury features like push-button reverse, ample wind protection, a mountain handlebar to facilitate travel in deep snow and standard storage bags. Our first choice last year, it remains a serious option for long distance riders looking for the creature comforts normally found on high-end two-up touring sleds. An 800 version was available during the early ordering phase, but the 600 engine will be a solid performer for many seasons ahead. With decades of knowing how long distance snow miles best can be conquered, Ski-Doo spares little in its Grand Touring model. The SE features a smooth, quiet four-stroke motor with exceptional low-end torque that provides excellent drive off engine power for moderate speeds and ample top end for those wide-open sections. The Grand Touring SE offers Ski-Doo’s latest air suspension technology that’s controlled via a handlebar-mounted rocker switch. SilenTrack technology minimizes excessive trail noise. Plus, as you’d expect with a Ski-Doo topline touring sled, there is fine style, heated seating and capacious onboard storage. Smooth, quiet and all day comfort sum up this best touring sled selection. A torque-laden triple and pleasant amenities highlight Yamaha’s GT. Adding to that pleasant feel is the addition of electric power steering. 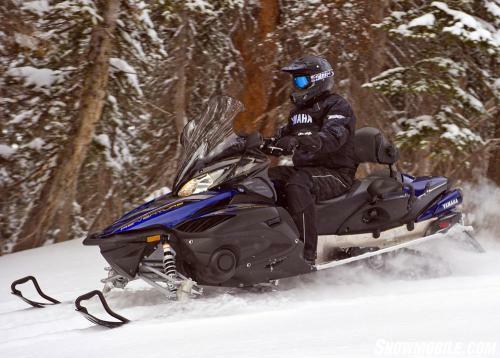 Fitting an extra long 151-inch track turns the Venture into a superior sport utility snowmobile that features electric power steering and the smooth power of Yamaha’s fuel-injected 1050cc triple. Add in extras like plentiful storage, wide powder skis, tow hitch and hard cap storage trunk. The Phazer-based two-up goes in the utility category as it adds wider utility skis, a 16×144-inch track for snow country versatility, and improved storage. The 500cc Phazer power plant remains.